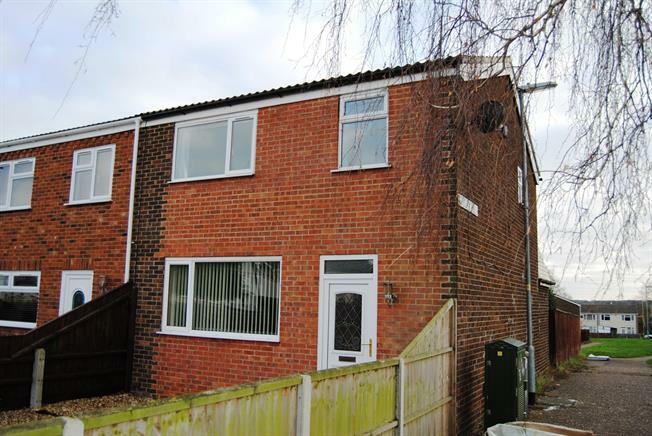 3 Bedroom End of Terrace House For Sale in King's Lynn for Asking Price £140,000. This extended 3 bedroom end terrace house requiring some modernisation/decoration, benefiting from recent tiled roof replacement. Consisting of hallway leading to lounge, kitchen with dining area leading through bricked archway to snug/play area/study? Upstairs consists of 3 bedrooms and a bathroom. There is a shingled front garden area and a relatively private rear garden with lawned area and shed. Further benefits are recently replace electric storage heaters. Call Abbotts for viewing details. Double glazed uPVC window, electric heater. UPVC sliding double glazed door, electric heater, composite work surface with wall and base units, stainless steel inset sink, space for, freestanding oven, space for dishwasher and washing machine. Double glazed uPVC window, electric heater, low level WC, panelled bath with shower over, pedestal wash hand basin.